So I’ve Torn My Meniscus, Why Should I Have My Knee Scoped? 1. The meniscus is the major shock absorber in your knee. 2. Once there is a tear in the meniscus it can easily propagate. 3. 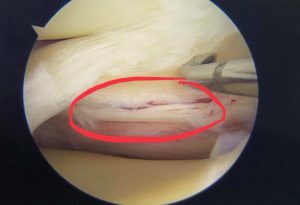 If the tear gets larger, more meniscus has to be removed at the time of surgery, resulting in a greater force to the articular cartilage of the knee joint, increasing your risk of early onset arthritis.